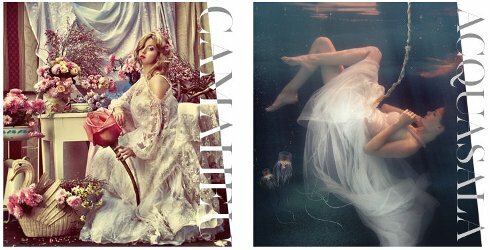 I've been trying another new niche perfume line this week — Gabriella Chieffo, a collection that comes to us from Lecce, Italy (way down in the "heel" of the "boot"). Chieffo herself is "a mother and environmental engineer" who "makes her debut as a fragrance designer with the intent to recapture the colors and materials of her beloved land." She also appears to be interested in weaving tales of feminine emotional experience into the fragrances. So far, I've tried two of them: Acquasala and Camaheu. If you're wary of most ocean-themed scents, you needn't fear Acquasala: it's a seaside fragrance with facets of spice and minerals rather than melon or suntan oil. Its black pepper and sheer incense are very much in evidence, along with a subtle vegetal note. After the aspects that remind me of driftwood and wet stone evolve, Acquasala's base is smooth and just a touch sweet. I happen to find seaside fragrances very comforting, and this one makes me want to visit the beach on a cool, cloudy day. If you like fragrances like Jo Malone Wood Sage & Sea Salt or Profumi del Forte Tirrenico, you may also enjoy this one. Camaheu is quite unlike Acquasala: it's a floral composition that "perceives the rigidity of the world, transforming it into a precious and seductive essence...like a cammeo, whose hard consistency is tempered by sinuous and sensual lines." It features top notes of grapefruit, ivy and bergamot; heart notes of jasmine and rose; and base notes of amber, oak, vanilla and musk. I'm an amateur admirer of cameos, and this olfactory tribute to them turns out to be very "me." Camaheu's roses and jasmine are definitely cut greenhouse flowers rather than the garden variety, and they're all dusted with a cozy face-powder accord and dipped in a creamy amber-vanilla base. There seems to be a subtle iris in the mix, and perhaps a little heliotrope as part of the powderiness. Camaheu's base, which is revealed very slowly, is a soapy-clean skin-musk. Overall, in fact, Camaheu reminds me not only of facial powder but of some very fancily wrapped scented soap that you'd receive as a gift and never want to open — except that it's a perfume, so you should definitely use it, and often. I'm hoping to have time to try the remaining three Chieffo fragrances over the next week or two; stay tuned for future reviews. 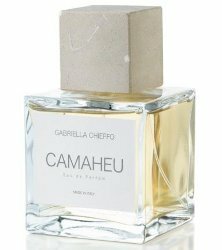 Gabriella Chieffo Acquasala and Camaheu are available as 100 ml Eau de Parfum ($170) via Indigo Perfumery in the US, Bloom Perfumery in the UK, First in Fragrance in Germany, or the Gabriella Chieffo website. Samples are also available. Jessica, thank you for the review of these new fragrances. I know that I would like Acquasala because of the comparisons you made. I like Wood Sage & Sea Salt, so I would probably like this one as well. Would you consider it long-lasting? With Wood Sage & Sea Salt, I find myself reapplying more than I would like. Acquasala sounds like it would be the perfect summer fragrance. And, I love the picture for the fragrance. Hi! I really like all the birth/rebirth imagery in the poem and the photo for this one. After all, we all came from the ocean…! Acquasala is longer-lasting than JM Wood Sage & Sea Salt. It won’t last all day on your skin, but it has pretty respectable persistence for something water/air-themed! Camaheu, on the other hand, has excellent staying power. These both sound very interesting. Have you tried Iris Nazarena? I know it’s not aquatic at all, but it has some of the same notes as Acquasala (incense, iris, spices) and to me at least a very “mineral-y” feeling, so I’m wondering if it’s at all comparable? Hi, Janice — it’s been a while since I sampled Aedes’s Iris Nazarena, but I recall IN being more “masculine” and much denser and more incensey than this fragrance. Acquasala is sheer, overall — very easy to wear in hot weather! It would be a perfect summer scent for spice/incense fans who need something light. I do particularly like the quirkiness of the first pic, surreal-retro? Yes, that Camaheu photo does seem very surreal! I don’t love it the way I love Lipstick Rose — it’s a bit blunter, and doesn’t have as much rose/violet/berry, nor that interesting vetiver under the powder. However, it’s easier to pull off for daytime or casual wear than LR — so LR-lovers may want to check it out!